बब मार्ली ६ जुलाई १९८० मा दल्य्मौंट पार्कमा भएको कन्सर्ट।. Henke, James (2006). Marley Legend: An Illustrated Life of Bob Marley. Tuff Gong books. White, Timothy (2006). Catch a Fire: The Life of Bob Marley. New York: Macmillan. .
Middleton, J. Richard (2000). 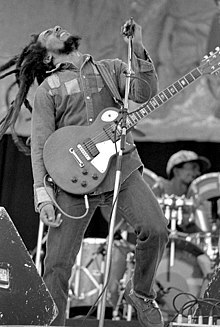 Religion, culture, and tradition in the Caribbean: Identity and Subversion in Babylon: Strategies for "Resisting Against the System" in music of Bob Marley and the Wailers. Palgrave Macmillan. Place of death Miami, Florida, U.S.